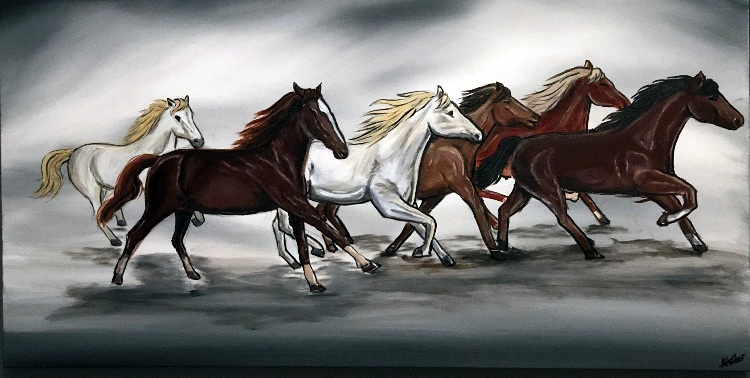 A stunning atmospheric and captivating large painting which captures the stunning graceful horses galloping under the grey clouds. This painting has been varnished with gloss for protection and signed by the artist in the corner. The canvas has been signed in the corner and continues over the sides so it may be hung without a frame. The painting has been wired at the back for hanging and will be packed into a custom made box and dispatched with 1 workings day by a tracked courier. Come with a certificate of authenticity.